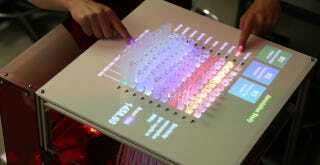 Will The Next Generation of Displays Be 3D? In a few short years, touchscreens have revolutionized the way we interact with technology. But to make the best use of our senses, the next generation of displays will not be flat, but have 3-dimensional, reconfigurable surfaces. Displays with pixels that can physically protrude from the surface will allow developers to enhance familiar applications such as architecture, design, terrain modelling and photography by rendering computer-generated 3D scenes in three dimensions in the real world. This will opens all sorts of opportunities for novel applications in team collaboration, tangible entertainment and ways to make computing more accessible to those with disabilities. Devices will be able to change their form and function: a mobile phone that mutates into a TV remote control, and then into a videogame controller, re-configuring itself to provide appropriate interfaces. Apps will not only be able to modify a visual display, but also dynamically change the physical properties of the device. The video below shows an interactive bar graph designed by Alexander’s lab. The display allows users to perform basic data visualization tasks, such as displaying and filtering data, organizing it into rows and columns, and making annotations. All things that, admittedly, you can do quite easily in Excel, but this sort of tactile manipulation might allow us to spot trends and patterns that we wouldn’t have noticed on a 2D screen. Who knows? Also, watching these colorful bars rise and fall is way more exciting than making barcharts the old fashioned way.